Nearly 860,000 people who have fled military persecution in Myanmar are living on bare earth floors under tarpaulins, with almost no protection from the elements. Weather aside, there is no way of knowing what lies ahead for them. Caritas workers from Trocaire, SCIAF and Caritas Bangladesh have been meeting people in the world’s fastest growing refugee crisis as they prepare for the cold, and an uncertain future. 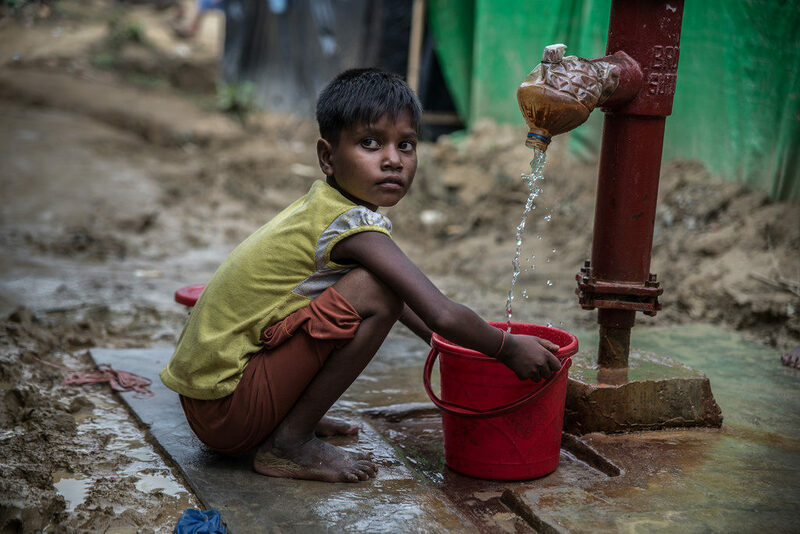 Noor Kalima, aged 7, has been orphaned by the military crackdown in Myanmar since 25 August. She is now being taken care of by family member Adija, who brought her to Bangladesh. 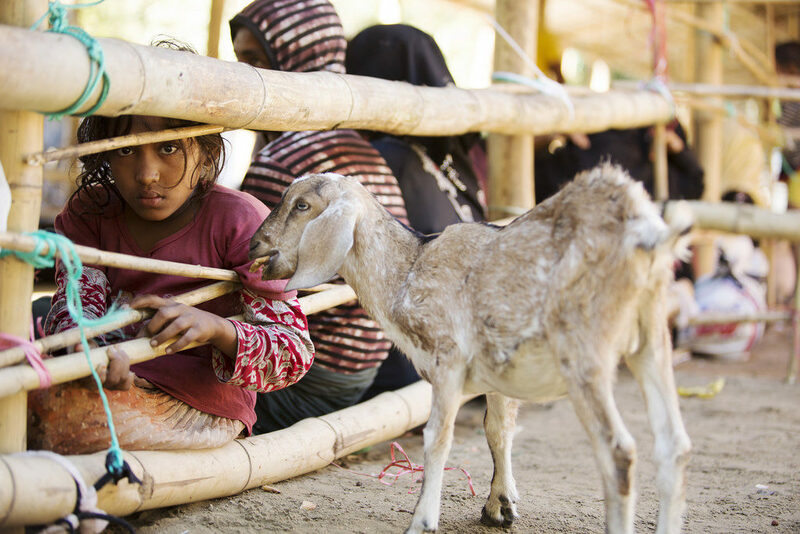 In the reception area for Rohingya refugees near Sabrang Khai harbour, new arrivals like Noor and Adija must sit inside bamboo pens, surrounded by soldiers, often overnight. They wait to be processed by the Bangladeshi authorities before being trucked to the vast Kutubalong camp. The UN estimates that 60 per cent of the Rohingya Muslims who have fled into Bangladesh from Myanmar are children. That makes Noor one of over half a million children forced out of their homes and country. Of those, 12,000 are, like her, orphans. Shawkat Ara is five months pregnant and now living in a Caritas area of Kutubalong camp with her husband, her parents having died crossing a river during the long, brutal journey from Rakhine State, Myanmar. Her account of their journey is grim. “The military attacked us in the night,” she told Val Morgan from Scottish Caritas member Sciaf. “Our village was burning. They asked boys who were around 10 and 11 years old to stand in a line. Then they chased them with machetes and chopped them in two. One old neighbour of ours was shot. Then they chopped him with a machete and burned him alive. He was just an old man. “Everybody just ran. It was raining and we were always wet. My hand was broken when I crawled in the jungle. We were hungry for many days… We were robbed of our gold necklaces and bracelets on the Myanmar border. After many days on the run through jungles and rivers, most people arrive with no possessions of any kind. Caritas teams are distributing kits with blankets, sleeping mats and floor mats to 14,600 families, around 87,600 people, who will sleep on the ground this winter. 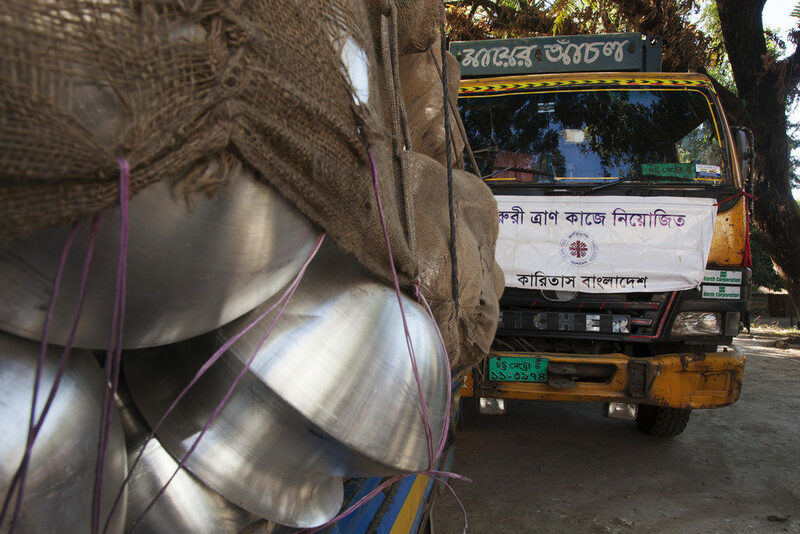 Caritas Bangladesh has been delivering staple foods to 40,000 families – around 240,000 people – since the beginning of October, together with a starter pack of household goods such as cooking pots, plates and utensils. Shared outdoor water points may be cold places to bathe or to wash dishes in winter but are still preferable to collecting water from muddy ditches as many are forced to do. 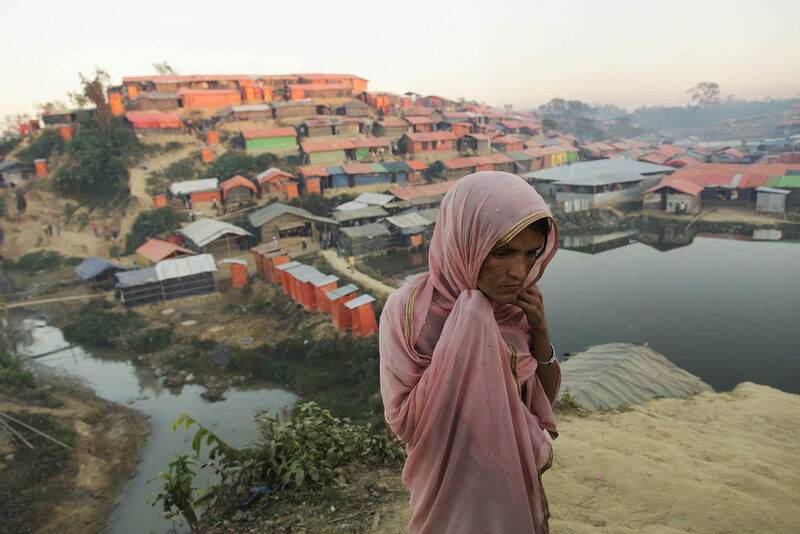 The threat of cholera and other water-borne diseases hangs constantly over the sprawling camp. Thousands of families like this one live in flimsy tented shelters built on perilous slopes, in what is a barely accessible area of Bangladesh’s flood plain. The potential consequences of monsoonal floods are barely thinkable. And that is not the only threat. Sturdy fencing is needed to stop wild elephants from blundering through the high-density living spaces. Caritas is working to improve vital infrastructure in zones UU and BB of the camp – levelling ground and putting in badly-needed drainage channels, water points and latrines, work that is being done in tandem with UNHCR. Caritas engineer Paritash Chakrebahty explains that the rapid influx of refugees into the area has led to dire conditions with shelters crowded against each other, and water points and latrines too close together. “We’re trying to reduce the vulnerability of people,” says Paritash, “put in drainage, prevent landslides, arrange housing, put in wells and latrines, and private bathing areas for women. 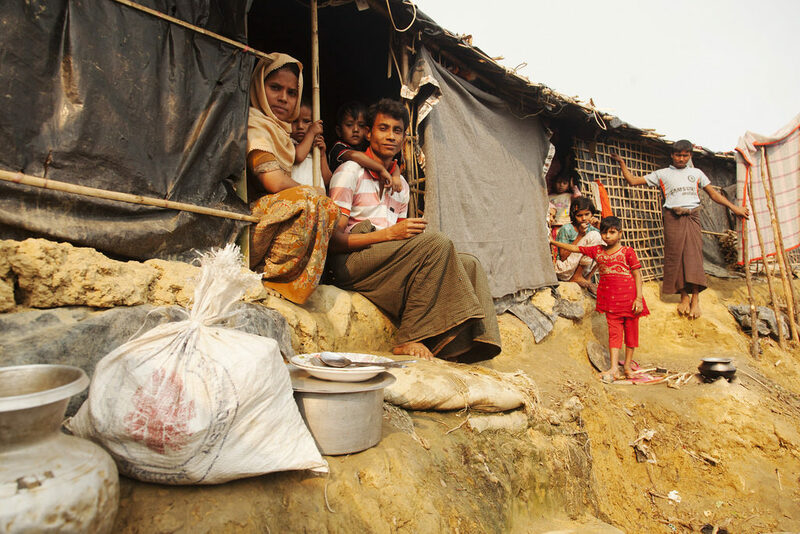 My hope for the future is to make the conditions in the camp better for the Rohingya, and resettle people in a more logical way.” The Caritas budget currently stands at $1.03 million. “The presence of God today is also called Rohingya.” These were Pope Francis’s words to Lalu, Syedudl Islam, Kamil Hussain, and Khirulamin, when he met and blessed them and 12 other Rohingya on 1 December. At an interfaith event in Dhaka that Caritas Bangladesh helped facilitate, the Pope turned the eyes of the world towards the intense suffering of these refugees. “I bear with me whatever you share with me,” he said, moved to tears by the encounter. Caritas will continue to share the journey of the Rohingya people as they leave one dreadful year behind and look to find some signs of hope in the next.